The United States has had a long, love-hate relationship with cannabis, and that is apparent in Humboldt County and the City of Arcata in particular. Let’s take an honest look at the ramifications Arcata faced and faces with illegal, quasi-legal and legal cannabis. Since 1937, cannabis, aka “marijuana,” has been illegal in the United States. At that time it was the second most prescribed medicine in the country. The physicians did not know that this “marijuana” that the Congress was proposing to make illegal was Cannabis Sativa, one of their most effective tools. As a matter of fact, the American Medical Association opposed the act because the tax was imposed on physicians prescribing cannabis, retail pharmacists selling cannabis, and medical cannabis cultivation/manufacturing; instead of enacting the Marihuana Tax Act, the AMA proposed cannabis be added to the Harrison Narcotics Tax Act. Their protest came too late. Not since alcohol prohibition has there been such a failure of policy and practice. Let’s explore the dark side of illegal cannabis. From the 1960s and ’70s, there was a movement, a back to the land moment that brought “hippies” to the North Coast. With them came their pot. This is the picture that has come to dominate. It is false. The illegal cannabis trade is not full of hippies. These are business people out to make a buck, pure and simple. When cannabis came to the North Coast, people grew it outside, in the sun. Then came CAMP, or the Campaign Against Marijuana Planting. Things changed. No longer were people willing to plant cannabis in their yard, or near their house. They were afraid that the choppers would invade them military style, and arrest them and take their children. They were right. This led to local radio stations, that will remain nameless, broadcasting CAMP flights, and when and were the Feds are on local roads. This has led to the sheriff in Mendocino County, Tom Allan, to call on this particular station to cease this behavior. Turns out that the local public radio station gets a lot of money in donations from local residents, so the station will continue to broadcast the locations of these police actions. So, now you can’t grow outside near your home, the capitalist American mind takes over and thinks, “Hmmm… where can I plant my crop that will keep choppers out of my backyard?” We all know the answer to that one: NATIONAL FORESTS. The move from mom and pops growing some cannabis in their yards on a limited scale, to massive “ganja plantations” had begun. Around the same time, somewhere in the 1980s people got the idea of smaller, higher-quality INDOOR gardens, higher quality genetics and custom bred strains. And so began the “indoor/ outdoor” wars. Along came the diesel generators humming into the night in rural Humboldt County. Massive, windowless structures running 20 to 100,1000 watt lights. These indoor gardens require pesticides, and fungicides. Retailers of fuel turning their backs when “growers” load massive amounts of diesel into unapproved containers in the back of pickup trucks, or worse yet DELIVERING the fuel and unloading it into unsafe, un-permitted, leaking storage tanks. This leads to spills that work their way into our watershed. All of this was a “wink wink, nudge nudge” relationship with the community. The growers contributed to local charities, brought music and culture to this rural area, and brought a more modern attitude to the coast. The community turned a blind eye to this because, with the decline in timber revenue, the area NEEDED some sort of cash influx. And so it went through the late 1980s into the ’90s, gradually getting bigger, gradually more forest land was being used, and less care was being taken with the land. Police were increasing the arrest rate, but the growers were multiplying faster than the arrests. Then something unexpected happened in 1996: Proposition 215 was voted into law by the citizens of California. Medical Marijuana was now legal, and things were about to change drastically. On November 5, 1996 things changed. Proposition 215 became the law of the land in California. No longer would patients have to fear arrest, or imprisonment for cultivation or use of medical marijuana, at least that is what we were promised. Since then we have had an INCREASE in marijuana-related offenses, not a decrease. We have seen police, DAs and entire counties DISREGARD the law that the voters enacted. Some, like San Diego, fought the law all the way to the U.S. Supreme Court, and lost. Since 1996, and the passage of prop 215, there have been two distinct classes of cannabis user, the legal and the illegal. It has been a nightmare for enforcement. Under the law a doctor may recommend medical cannabis to any patient with a disease or disorder that the doctor feels may be helped by cannabis therapy. Yet the arrests multiply. Some police say that there are “too many healthy looking young adults” using medical cannabis. Other police cite increased crime, although the facts don’t seem to bear that statement out (unless you count legitimate patients using cannabis a crime, which some police do). The fact that people can get a piece of paper from a doctor that gives them the RIGHT to posses, use, and cultivate cannabis led to a sea change in cannabis production. People were no longer scared to plant a few plants in their yard, and people that live in towns, and in smaller units felt perfectly safe installing an indoor cannabis garden. They were mistaken to feel safe. The police continue to raid sick patients’ homes, destroying their medicine, taking them to jail, ruining their personal possessions, having CPS come to take their children, costing them tons of money to defend themselves, and some are bullied into taking plea bargains for something that was not a crime for them under the law. The Berry Decision: The court found that patients may use cannabis while on probation or parole. The Bearman Decision: The court found that qualified patients making edibles, hash, and kief are “clearly legal,” but that using butane to make “hash oil” is a chemical extraction that is not covered by Prop 215, the CUA, even though the oil itself is a legal product. The Mentch Decision: The California Supreme Court found that the “caregiver” defense was only open to persons “who have consistently assumed responsibility for the housing, health or safety of that person.” This decision did not limit the activities of patient collectives or co-ops operating legally under Health and Safety Code 11362.775. The Spark Decision: Judges and Juries do not get the option of second guessing a doctors recommendation. The physicians are the “gatekeepers,” not the courts. San Diego v. NORML: California counties and agencies MUST follow California law, not Federal law. Federal law DOES NOT TRUMP STATE LAW. The Windus Decision: A doctor’s recommendation is NOT an annual requirement, it can be good for years. A doctor’s dosage is “advisory,” it does not limit a patient from possessing a “reasonable” amount even if it is more than what is recommended. The Kelly Decision: Three separate Appeals Courts ruled that the limits on the amount of cannabis a patient may possess listed in SB420 were UNCONSTITUTIONAL. The Court found that the “limits” were fine as a “safe harbor” for State MMPA card holders, but did not limit the ability of qualified patients to posses more or use the MMPA as a defense in court. The Court also found that the State ID card system IS constitutional, and that patient co-ops and collectives operating under HS 11362.775 are constitutionally protected STATEWIDE. Given all of these cases it is amazing that the police are still arresting legitimate patients. Now we all know about the “grow house” epidemic. I would say it is overblown. Ninety percent of the cannabis being grown in Arcata is legal. What is not legal is the wanton destruction of rentals. Let me make myself very clear here: WE ALL HATE WHAT IS BEING DONE TO RENTAL HOUSING. That being said, it is not legal to restrict patients from using, possessing or cultivating their own medicine in their own home, and that does in fact include rental. The practice of screening potential renters and placing “no 215” in rental adds is ILLEGAL, it is a violation of the Thomas Bane Civil Rights act. Let’s also be clear here, it is already illegal to destroy a rental property. It is already a crime to steal electricity. Let’s focus on those issues, because that is where the actual damage to properties comes from, the ILLEGAL grows that are only in it for a buck. Cut to 2010. The courts are now wading into the authority of local communities to limit Prop 215 activities. On June 4, 2010 in Red Bluff patients supported by CANORML filed a lawsuit against a county law that limits their right to grow medical cannabis in their own homes. The plaintiffs claim their rights are being violated by an ordinance that makes it impossible for them to produce their own medicine, as is allowed under state law. The Tehama County ordinance declares it a public nuisance to grow marijuana anywhere within 1,000 feet of a school, school bus stop, church, park, or youth-oriented facility; restricts gardens to no more than 12 mature or 24 total plants on parcels of 20 acres or less; requires outdoor gardens to be surrounded by an opaque fence at least six feet high and located 100 feet or more from the property boundaries; and requires every patient garden to be registered with the county health services agency for a fee to be determined. Nowhere in Prop 215, nor the MMPA does it allow for any of those restrictions. California NORML attorneys argue that local governments cannot legally declare activities that are protected by state law to be nuisances. They are correct. “They can’t take everyone’s rights away,” says attorney Edie Lerman. California law states patients can have whatever they need for themselves and for collectives.” Lerman is also the lawyer for a lawsuit aimed at Mendocino County’s 25 plant per parcel ordinance.”The right to cultivate is fundamental to Prop. 215’s mandate that ‘seriously ill Californians have the right to obtain and use marijuana for medical purposes,’” says California NORML Director Dale Gieringer, a co-author of Prop 215. If prior cases are any indication, State law will “trump” local ordinances. Only time will tell if the ordinance that Arcata passed will stand. This November the voters of California will have a vote on the single biggest issue they have ever been asked. Will you vote to legalize, tax, and regulate cannabis? The polls show 56 percent support for legalization in California, and that number seems to be rising. On June 29, 2010 the California NAACP announced its “unconditional support” for The Regulate, Control & Tax Cannabis Initiative 2010. In 2008, police in California made over 61,000 arrests for marijuana possession offenses, a criminal misdemeanor. Law enforcement made over 17,000 additional arrests for marijuana felony violations – a category that includes personal cultivation of even a single plant. This number also includes many medical cannabis patients that were not violating the law in any way. This is a time when we can all get together and make something that has been a part of our community for years into something that will revitalize Arcata. And the entire North Coast. We could be the first community to fully embrace the Legalization of cannabis by allowing retail stores, smoking lounges, Amsterdam-style coffee shops, tasting tours, schools to learn how to grow it yourself, wholesale production – the sky is the limit really. We recently lost our airline service to the major hubs because we could not fill the seats. Imagine how many people would come here to vacation if we were the Amsterdam of the West Coast? Enough to bring the airlines back, that’s for sure. We would stop losing housing to “grow houses” because anyone that wanted to grow commercially could get a license and rent or buy a place to do so. Our police could go back to making the quality of life better in Arcata by focusing their limited resources on “quality of life” crimes like aggressive panhandling, public intoxication, public urination, camping/loose dogs in the parks, DUIs, and making it safe for women to walk down the street at night without being sexually assaulted, like the young woman who was raped on Monday night at the Arcata Sports Complex just a few feet away from a softball game. 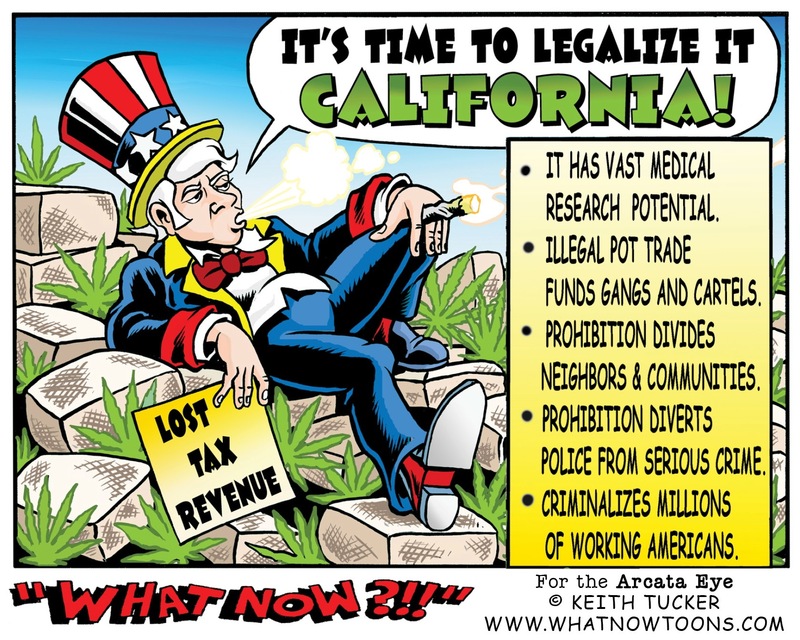 For once we have a chance to get something right in this state, and I for one hope we vote YES on The Regulate, Control & Tax Cannabis Initiative 2010, also known as Prop 19. Mark N. Sailors is owner/pilot of Arcata Kineticab. This entry was posted on Wednesday, July 21st, 2010 at 8:15 am	and is filed under Opinion. You can follow any responses to this entry through the RSS 2.0 feed.